Thanks to you, believers who've waited a lifetime are finally getting Bibles. Photo credit: Clare Kendall, British and Foreign Bible Society. At 69, Guangen received his first Black Yi Bible. Tonight, people are staying up past midnight. Tonight, people are crowding together in churches. Tonight, people can hardly contain their excitement. Because tonight, God visits their village. Tonight, God speaks their language. Tonight, they receive the first Bible they can understand. You should know this story, because—along with a community of partners 300,000 strong—you delivered these Bibles. But before we can celebrate the significance of these Bibles, we need to understand the history of Christianity in China. For years, Chinese believers had to keep the Scriptures hidden. Secret. Quiet. Any Bibles discovered by the Red Guard were confiscated and burned. 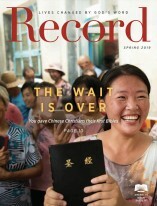 “In the Cultural Revolution, we dug out a space in the wall behind the bricks and hid the Bible in the wall,” says Wenfu Zhang, a pastor in southern China. Many believers copied Scripture verses under the cover of night, risking their safety to memorize the words of their Savior. Years later, after a governmental transition, the restrictions on religion were lifted. Gloriously, believers were freed to practice their faith in the open. To read God’s Word in broad daylight. But there was a major problem. And that problem still hasn’t been fully resolved. Although believers could legally read the Bible, most didn’t have one to read. Make no mistake: Christianity is now the fastest-growing religion in the country, with more than one million people coming to faith in Jesus each year. China is also home to the world’s biggest Bible printing factory, our partner Amity Press. But there’s a long way to go to recover from more than a decade of secret faith and Bible burning. for young believers who want to know the truths of God’s Word. Through your prayers and giving, you’re making a difference for believers in China. How? Let us introduce you to Guangen. Guangen lives high in China’s Cloudy Mountains, where the air is thin. Where the mist rolls in thick. Where he says he feels close to God. His speaks Black Yi—one of China’s minority languages. China’s national language is Mandarin Chinese, but China’s Education Ministry reports that approximately four hundred million people—or 30 percent of the population—don’t speak it. For people like Guangen from China’s ethnic minority groups, having a Bible in Mandarin won’t cut it. 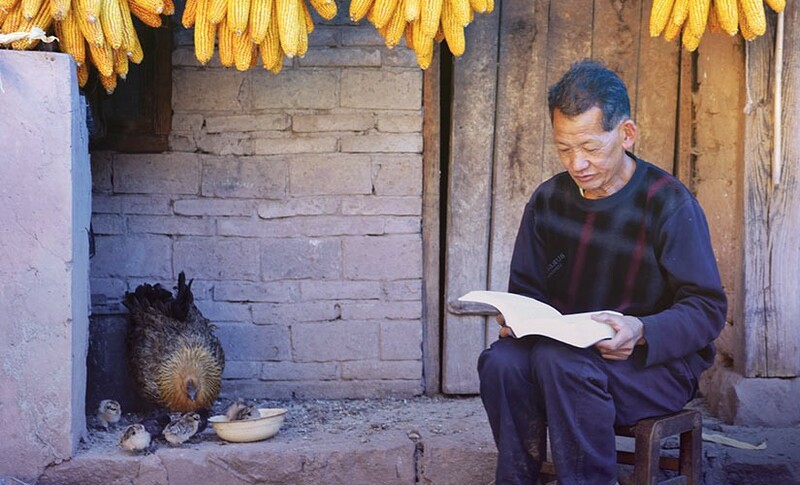 For years, Guangen longed to hear from God in his heart language: the same language he prays in, barters in, and uses to coax his chickens out to eat. Finally, one day Guangen heard a beautiful rumor that the town’s pastor was going to deliver the Word of Life in Black Yi. Could it be that God would meet us here, all the way up in the mountain, 9,000 feet above sea level? A lot has changed in China since the Cultural Revolution. But one thing hasn’t: Bibles are still as precious as ever. It might sound small to you, but a shipment of 20 Bibles to the Cloudy Mountains of China made a big difference to the residents there. Do you remember those believers waiting up at midnight? They were huddled in churches, watching the door, waiting for Pastor Wenfu to arrive with the Bibles that had been translated into their native tongue, Black Yi. There weren’t enough Bibles for everyone that night. But that put no damper on their enthusiasm. Community members held out their hands, tears streaming down their cheeks, eager to receive their treasure, their 20 Bibles. Your prayers and gifts translated, printed, and distributed these Black Yi Bibles—and 10,000 more! Guangen was among the first to be given a Bible. “When the pastor brought the box of 20 Bibles to the village, I was so happy,” Guangen says. Guangen was “so happy” because he’d waited a lifetime for his Bible. He was only 18, still a teenager, when religion was outlawed in China. By the time the worst of the restrictions had been lifted, he was nearly 30, an adult. When he was 41, he met Jesus and believed. Guangen’s story of waiting decades for a Bible in his language is not uncommon. Many elderly people like Guangen who live in China’s remote regions have been praying for a miracle. It’s a miracle you probably open every morning. A miracle you hear quoted in church. A miracle you read to your children and grandchildren. They have been praying to receive God’s Word in their heart language, before they pass away. For the Black Yi community, that miracle has been realized. As important as it has been for the Black Yi elders to read the Bible before their generation passes, the community finds it even more important for the next generation to be rooted in God’s Word. During the ban on religion, the elders were unable to freely teach their children from God’s Word. Now they’re on a high-stakes mission to make up for lost time—praying fervently for Bibles to introduce their children and grandchildren to the God of miracles. For the Black Yi community, an important step in sharing the Bible with the next generation is hosting literacy classes. Many young students in rural Chinese areas are forced to skip school to tend to crops and livestock. As a result, they never learn to read. They’re held back from more diverse work opportunities. More importantly, they’re blocked from reading and understanding Scripture. Through United Bible Societies China Partnership, literacy courses are being taught using the Bible—training the Black Yi community to understand the miraculous words of God. This isn’t the end of the story. Thanks to support from people like you, Bibles and Bible study resources are being printed in China. Communities across China are learning to read God’s Word for themselves—protecting them from false teachings. Students in China are being trained as pastors to bring God’s Word back to their communities. God is on the move!